Ol' Myrt here did promise we would hold additional sessions, so here we go! The MGP Study Group 2 will begin in February 2014 to focus on Mastering Genealogical Proof by Thomas W. Jones, CG, CGL, FASG, FUGA. We were quite happy with the use of the Google+ Hangouts on Air platform as our first series of MGP Study Group sessions were auto-archived on DearMYRTLE's YouTube Channel. BASICALLY all will "major" in the study of Mastering Genealogical Proof for the duration of this series. We're going to eat, sleep and breathe this project until we get it down pat. 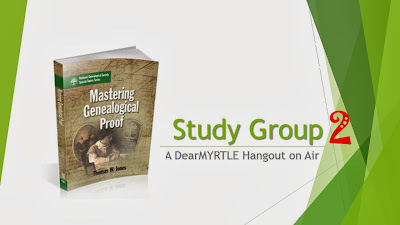 There are some revolutionary thoughts in this book that will be a paradigm shift for even some experienced researchers.This DearMYRTLE's MGP Study Group is not sponsored by the author or publisher of Mastering Genealogical Proof. The 10-session series is designed for genealogy researchers to study Dr. Jones' ideas in a positive, collaborative, peer-group setting. These methodology ideals can be translated into any locality or ethnic group research a genealogists is likely to encounter. The MGP Study Group 2 will have one advantage: we can view the archived sessions of the initial MGP Study Group in addition to attending our own sessions. To be determined. If we have enough interest in a UK study group, we'll move the sessions from Sunday night to Sunday morning US time, to better accommodate the UK attendees. Sit in a quiet space, away from all distractions for the duration of the HOA. Be sure the background is presentable to the camera. Communicate with other panelists in the private Google+ Community to which you will be added. This is where we clarify procedure. Read the chapter prior to each HOA discussion. Be prepared to indicate two favorite sections of a chapter to discuss during each HOA. This is your chance to explain briefly how each section applies in your personal research. Be alert to requests to cycle in and out of the panel during the live HOA. There will be 15 panelists, but only 10 can be in the discussion at a time. The changes can happen once or twice during each HOA. Complete all workbook assignments by Friday after the scheduled chapter discussion, posting a link in the Google+ DearMYRTLE Genealogy Community under the specific post on that chapter. Remember copyright standards when quoting any small portion of Dr. Jones' book. See: MGP Homework and Copyright for guidance here. Factor in time for all other panelists to respond and govern one's self accordingly. Avoid self-promotion of products or services, except when providing links to one's blog where assignments are posted. If you need help setting up a blog, DearMYRTLE will help you one on one. Reflect a kindly attitude and be eager for peer review of homework assignments. I am so glad you are going to organize another MGP study group :) I have been watching the first group on You Tube, and it has helped me tremendously. I can't wait to apply to be a panelist for the second study group! I've received your "official" submission. Thank-you for stepping up and being willing to serve on the panel. Cousin +Russ Worthington and I will make the decision by January 1st. Really would like to do this but I guess it depends on time. I could probably do Sunday evenings (USA) but one week a month I couldn't "guarantee" no distractions. Sunday mornings would not work for me as I'm a church goer. I look forward to your "official" submission, Genie. Ol' Myrt here literally throws a slip of paper in one of Mr. Myrt's hat to choose from among the submissions. I'd really like to do this also. 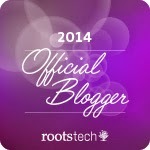 It will begin after RootsTech.. hoping the times are in the evening on Sunday also.... I very much enjoy Cousin +Russ Worthington and +dear myrtle on Mondays.. makes my genea-week!